I'm finally back with a new blog post, it feels like forever since I last wrote one, as I've been away in Sri Lanka for 2 months this summer (look out for plenty of layouts featuring photos from my trip in the coming months). 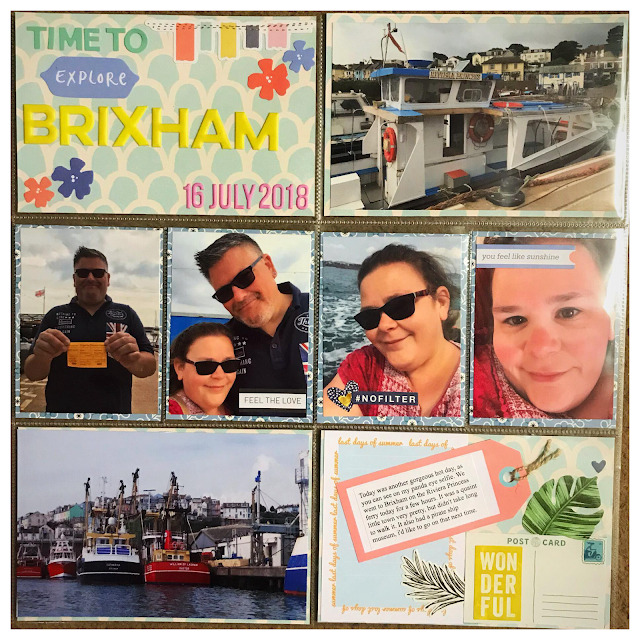 Today I'm here with my first layout using the July/ August 2018 kit. 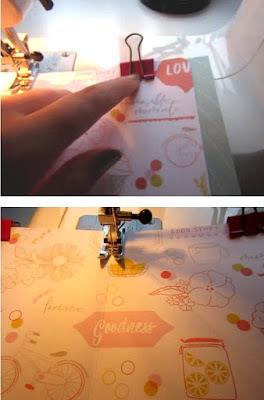 Firstly I took the Happy Life paper which is made up of lots of strips of different patterns and I cut them all into strips. I laid a few of the strips of various sizes on the left hand side of the white cardstock. Allowing me to create a layout which looks like I have used multiple sheets of paper, rather than just one. I mounted my square photo on white cardstock and used foam pads to lift the photo off the strips to help it stand out. 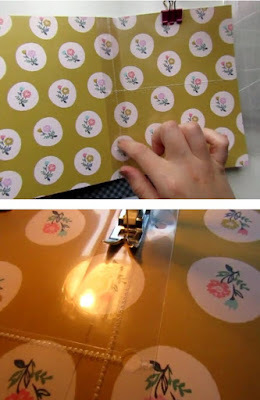 Next I worked on my embellishing by fussy cutting flowers and lemon slices from another sheet of the same paper using the floral strip. 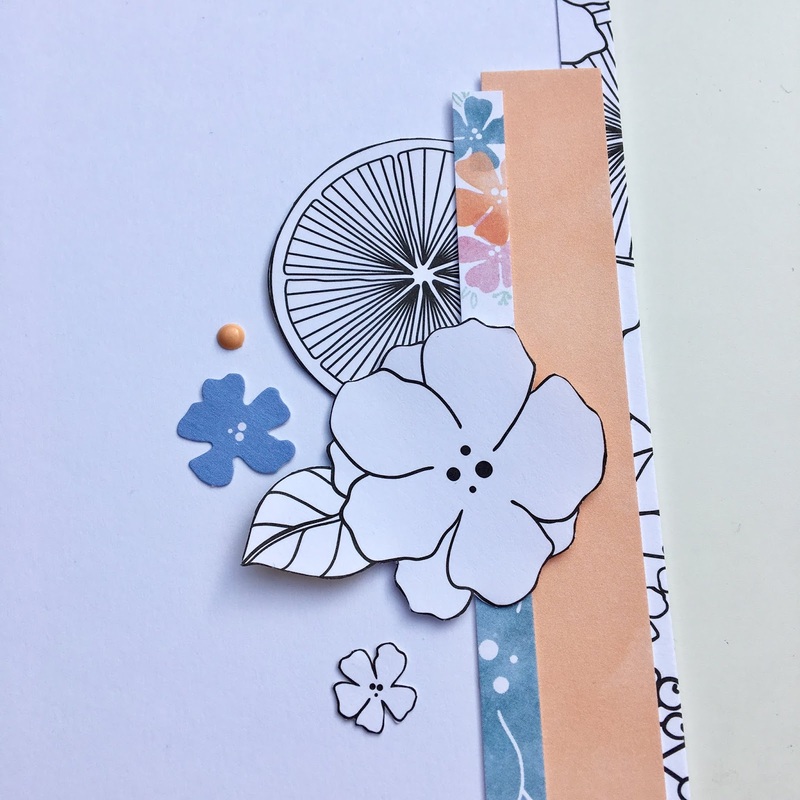 I often try to use a visual triangle on my layouts so I added a second cluster of paper strips and flowers to the top right of the layout. Adding coloured flowers from the ephemera pack and enamel dots from my stash. To complete the triangle I added another cluster in the bottom right corner. I added 2 fussy cut flowers and another strip of patterned paper to ground the cluster. 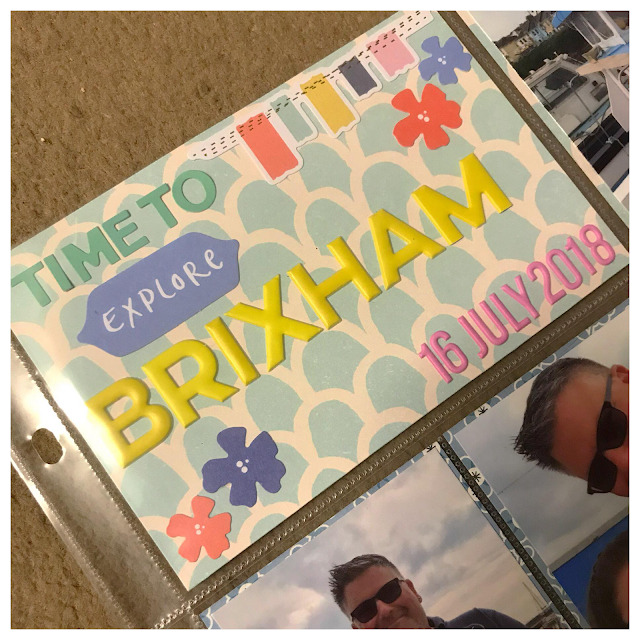 I used to hate all the & icons in scrapbooking, I just couldn't understand when you would use them, until I realised you can use them on any layout of two people together! I used my laptop to print out 3 journalling strips with a typewriter font. For my title I used another puffy sticker, which compliments the blue and orange in the papers perfectly. I added an orange flower from the ephemera pack, as well as the "you feel like sunshine" ephemera piece. Thanks for reading, see you soon with my next layout! I've been playing around with Brusho this week and I've put together some ideas you could try out. The first one I tried out was a bubble wrap monoprint and the second technique I tried out was to stamp with Brusho. 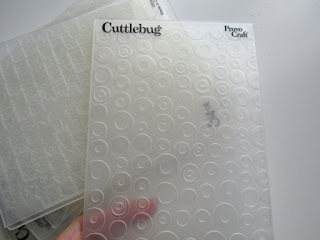 For the bubble wrap monoprint you'll need your Brusho, (I'm using the Brusho Gamboge from the current Lite kit). A piece of bubble wrap and something to add water to it with, I'm using an old empty cosmetic spray bottle to spray water onto the Brusho to activate it. I also used a little tape to hold down my card to help it dry flat. For the Brusho stamping you'll need your Brusho, a piece of plastic packaging, a paint brush and water, (in your spray bottle or you can dab it from a paintbrush). 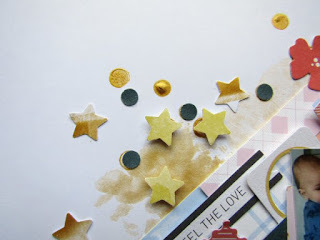 While I played around with the technique I discovered that the best impressions were made using deep cut stamps with simple designs. Some stamps I have are kind of etched with the etched design quite shallow on the stamp. These kinds of stamps didn't work as the Brusho just pooled into the design and didn't pick up the details. I tried out both red rubber wood block stamps and cling stamps and both worked so long as the design was a deep cut one. The background was the bubble wrap monoprint I created in the video and then I used all the off cut bits of white card I had for the Brusho stamping and cut those out into pieces. I've then layered those along the top of the page and fixed them down with stitching. 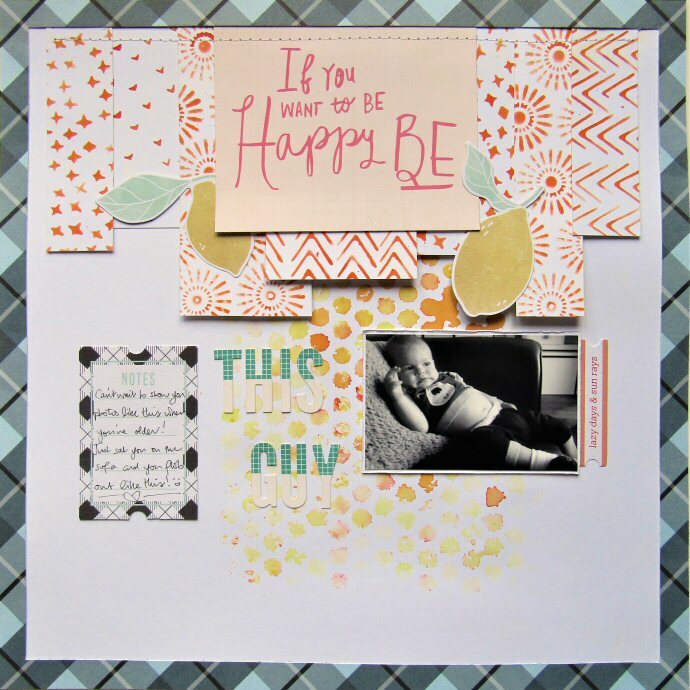 I cut out one of the phrases from the Crate Paper Willow Lane paper in the Lite kit. The frame I cut out from the Aberdeen paper from the Lite kit using my paper trimmer to cut out the middle of the sheet and leave the 1/4 inch wide frame piece that I've glued to the outside edge of my page. I had the Pinkfresh Studio die cuts from the main kit on my desk so I added four of those just to finish it off. Hope the video's inspired you to have a go at these ideas with your Brusho! It's really fun to just play around with and see what comes out. 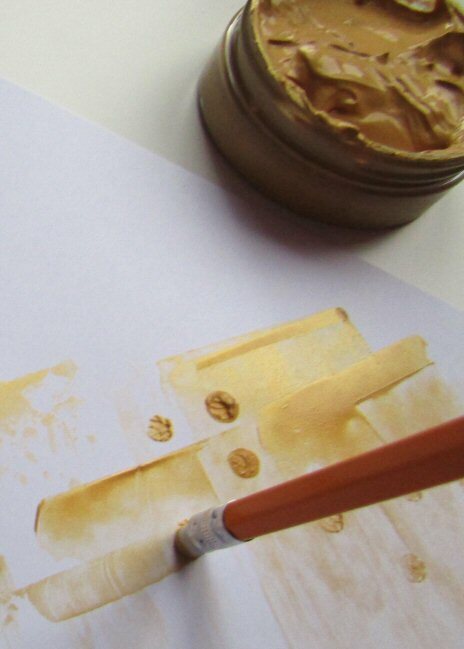 You could use the same principles to make a print using anything that has a texture. As promised here's the minibook project I've been working on. 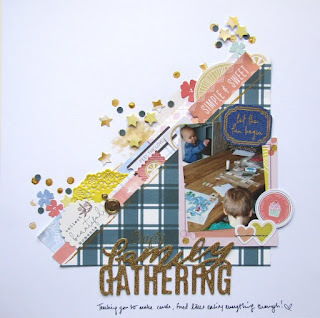 My idea with this was that if you have a kit that's not been used you could grab the whole kit and put together a mini scrapbook from scratch. It could also be made from lots of left over bits of kits. 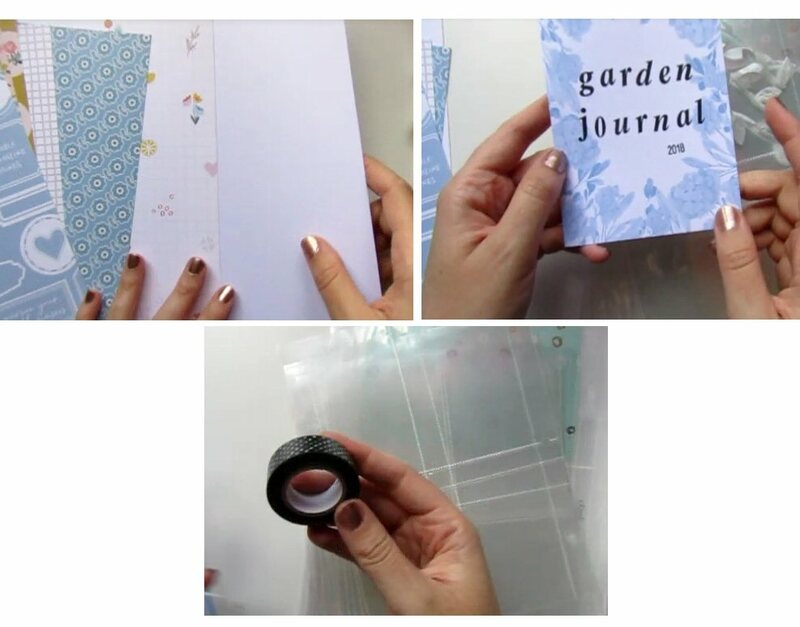 It'd be a great way to record a summer holiday or a day trip or as I'm doing, using it as a journal. Mine's going to record my planting/gardening successes this year. 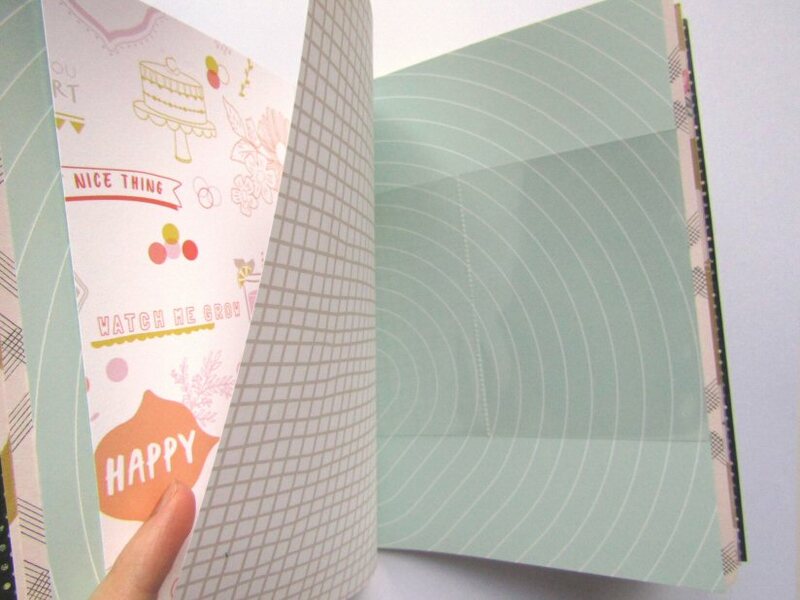 I've collected together six sheets of scrapbook paper and one plain card sheet. 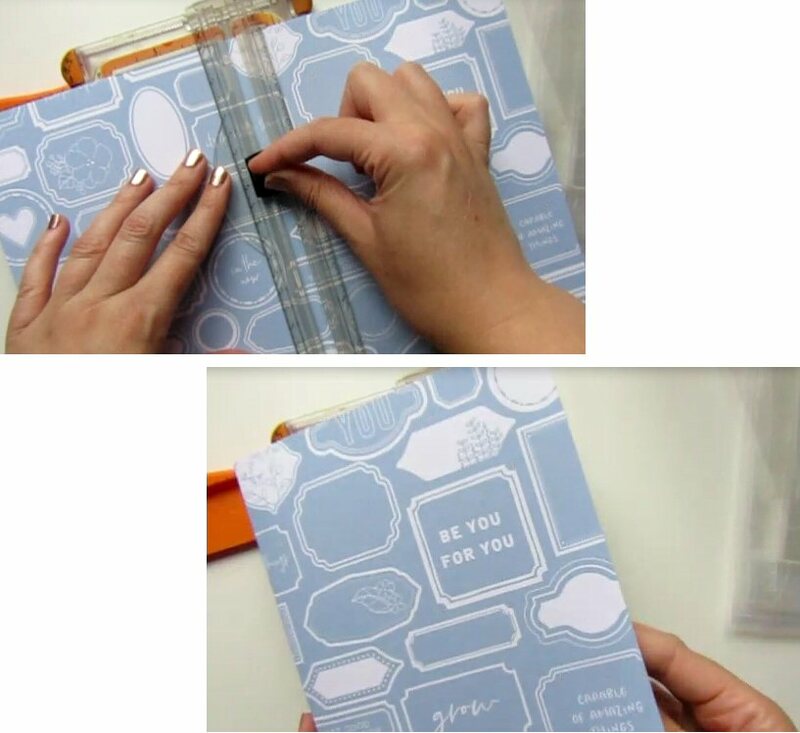 A washi tape. And also some smaller page protectors. I've also pulled out some pocket cards. One 4x6 one I've stamped on to use. Next I've cut all my pages out and folded them down the centre. My pages I cut to 8 inches x 12 inches and folded them in half to make each page 6x8 inches. Next I stacked the pages one on top of the other with the piece I wanted as the cover on the outside. I trimmed the edges of the inside pages to make them varying sizes. This also means that my cover now encompasses all the pages when they're folded together, rather than stick out. Next I added my page protector pieces. 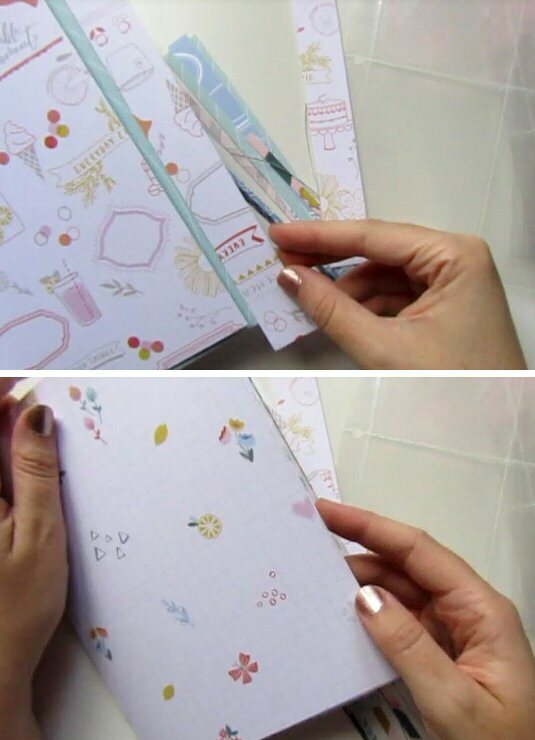 I placed them on the inside of a page with the margin edge overlapping the fold on the page. I held it in place with clips then stitched down the page fold with my sewing machine to fix it in place. If you didn't have a sewing machine it could be hand stitched in place, (use 3 or 4 large stitches down the fold). Finally I stitched the whole book together. I've stacked up the pages again in the order I wanted them and held them together with clips then stitched down the folded line on the books centre, (the middle page). Here's my finished book. 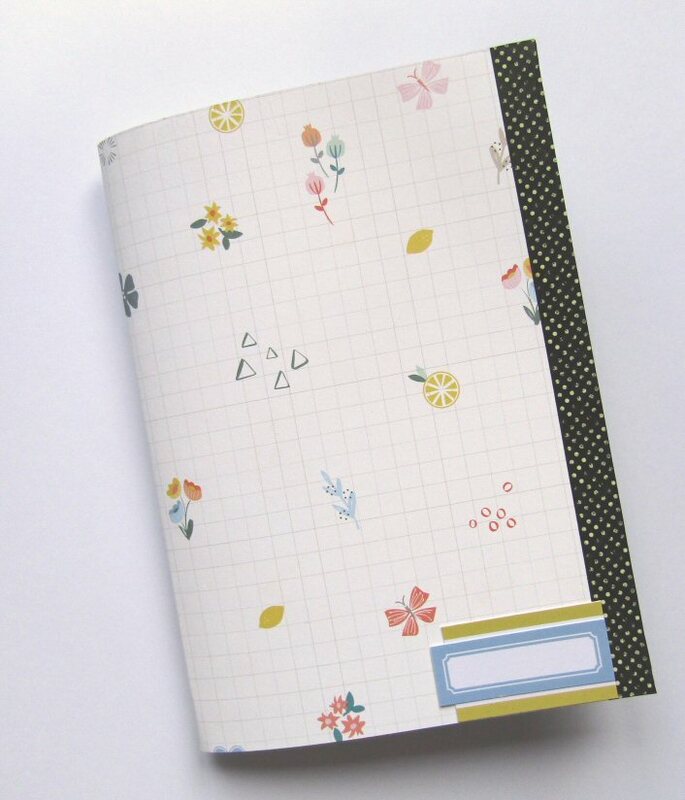 I added some washi tape down the edges and added a label to the front. Here's one of my page protector pieces inside. 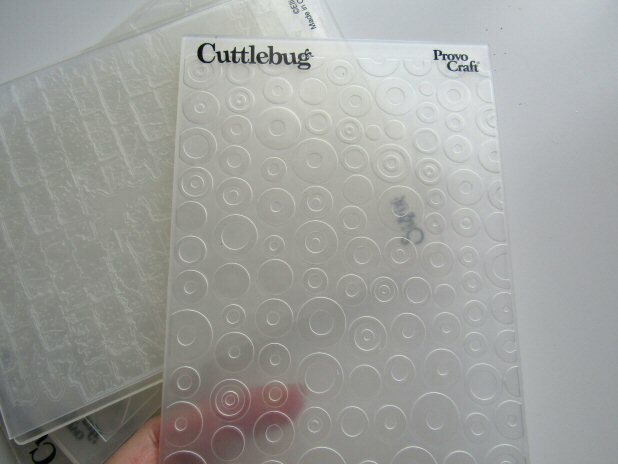 I can use these to fill with ephemera or pocket cards with extra notes. Without further ado...here is what I used and how I created my spread. For this layout I started with the main title card pocket, as for me, these are always fun to do, and gives me a chance to express my personality through embellishing etc. I cut the Willow Lane Violet paper into 4 6x4 pieces and used these to back the 6x4 photo's as well as the title card. 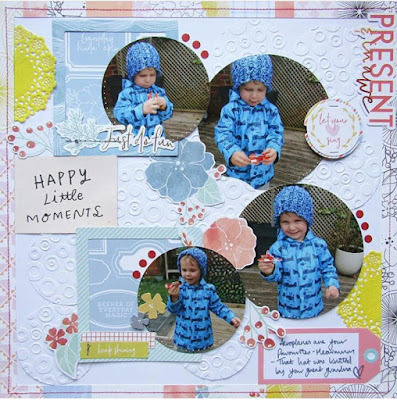 The four 3x4 cards are taken from a strip of the Jen Hadfield Blue Garden paper. I love how the colours matched not only each other, but also my photographs. My title was created using 3 different alphas as well as a piece of ephemera from the main kit that says "explore". I also used the banner and flower pieces of ephemera to finish off this card. The middle cards feature pieces of the PFS Simple & Sweet ephemera as well as some stickers from the Wild Heart sticker sheet from the previous kit. 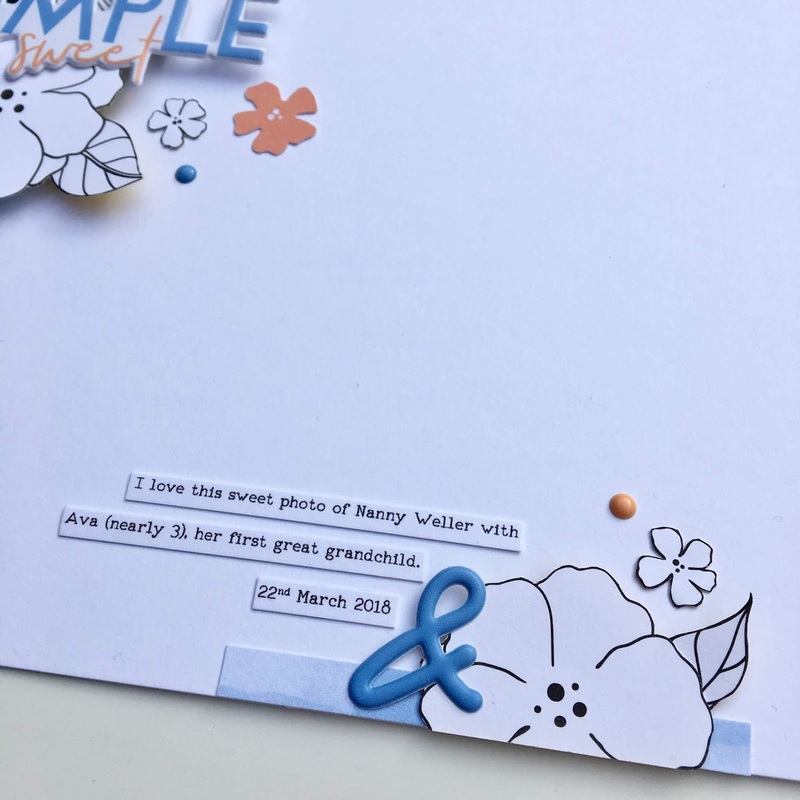 Finally the journal card was created using a 3x4 card from the current custom card kit, and also the peach tag, which I layered on top. 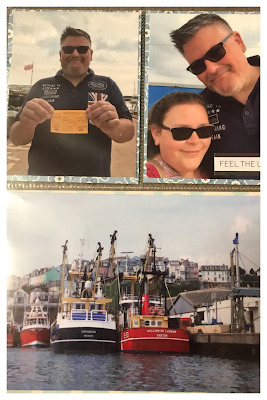 I used a postcard from the Here and There sheet from the previous kit, plus more stickers from the Wild Heart sticker sheet. I added a small piece of twine from my own stash to finish the tag off and typed up the journaling in my Silhouette software. I love how the colours add to the nautical theme for this spread, and the tropical elements from the previous kit complimented it perfectly. Sometimes it's good to hold stuff back like this for the perfect photo's rather than just using it for something that may not necessarily work. 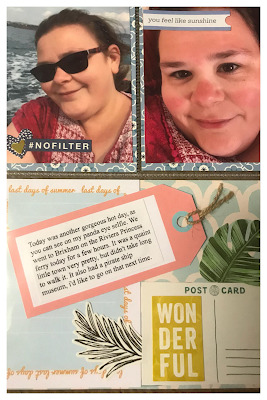 I've been creating with my new July/August Quirky Kit goodies this week. 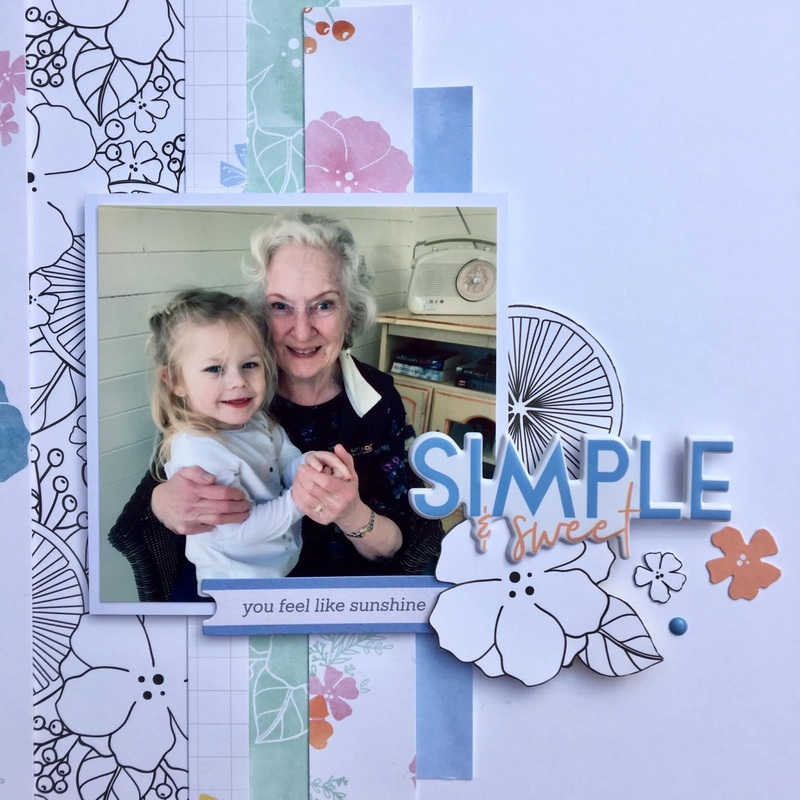 Both layouts use texture but in two different ways. I'm just starting a homemade mini book project too so look out for that project popping up over the weekend. I've not used these in literally years, and years so they were due a dust down! If you've not used these before, the idea is you add your paper or card to the inside of the folder then roll it through a die cutting machine and it embosses the pattern into the card. 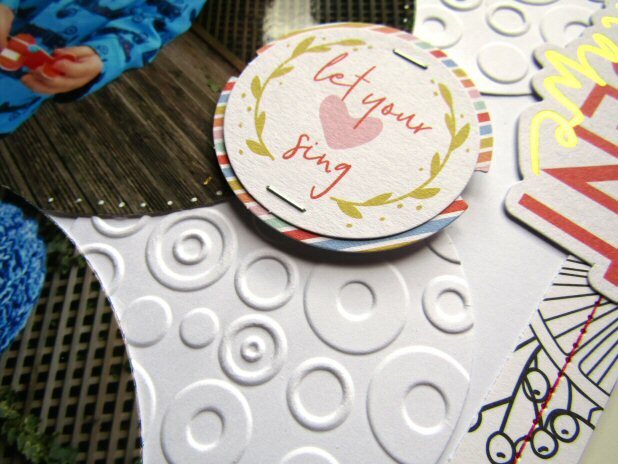 I cut out the circles of plain white cardstock first and then rolled them through the embossing folder to get the pattern/texture on the pieces. 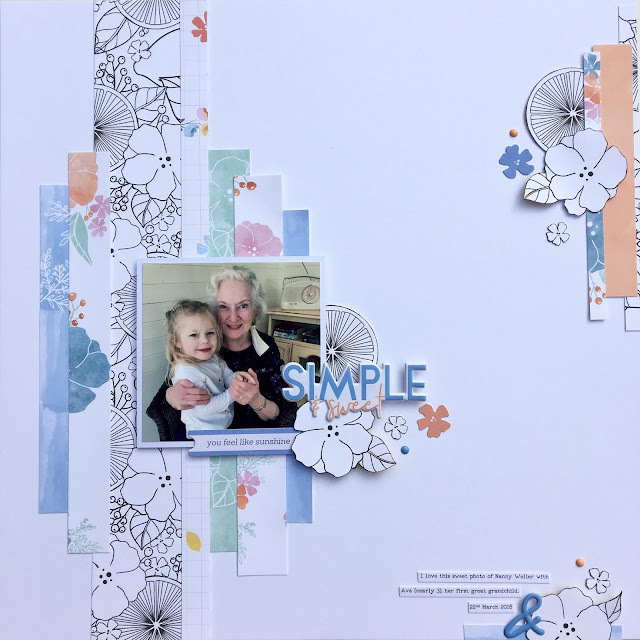 While I was using my circle dies I decided to cut out my photos in circles too and it meant I could add all of the photos I had onto my page along with lots of embellishments, which I like! More is more ;) The outside edge I cut out from one of the Pinkfresh Studio papers from the main kit, using my paper trimmer to cut out the frame then stitched it down with machine stitching. The tag is from the Custom Card kit labels pack, the frames from the embellishment kit and the die cuts from the main kit. Once that dried I punched out some star shapes from it to use as extra embellishments. I then added some more tucked under the edge of the triangle. Paper strips, (the Pinkfresh Studio Happy Life sheet with all the different pattern stripes on it cut apart) and some of the Pinkfresh die cuts, (both from the main kit). One of the pieces is a piece of the Pebbles paper with the cut out squares on, cut out with a scallop circle die. I popped one of the pocket watch brads to the side of it. Along with the die cuts I added some punched out stars and paper pieces, (made with a hole punch). I just wanted to add some more of that navy colour to the layout so I punched it out of the paper. As a final touch I added one of the gold glitter phrase Thickers, (main kit) and some of the little glitter stickers to add to the title. As I mentioned earlier I'll be back this weekend to share a mini book project. 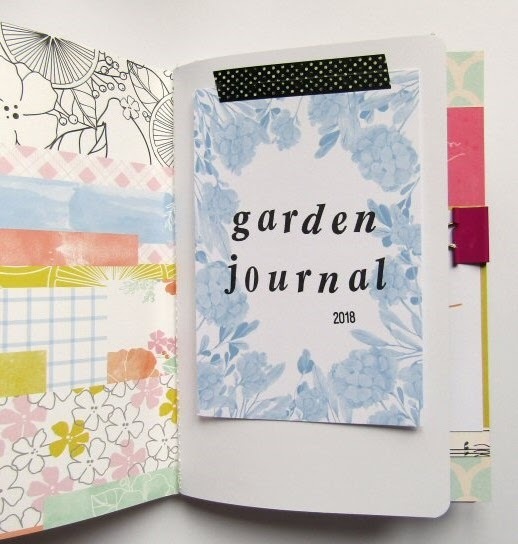 It's a journal I've made from sheets of scrapbook papers so it's a great project if you have a kit unused as you can just grab your kit and create a whole project with it. 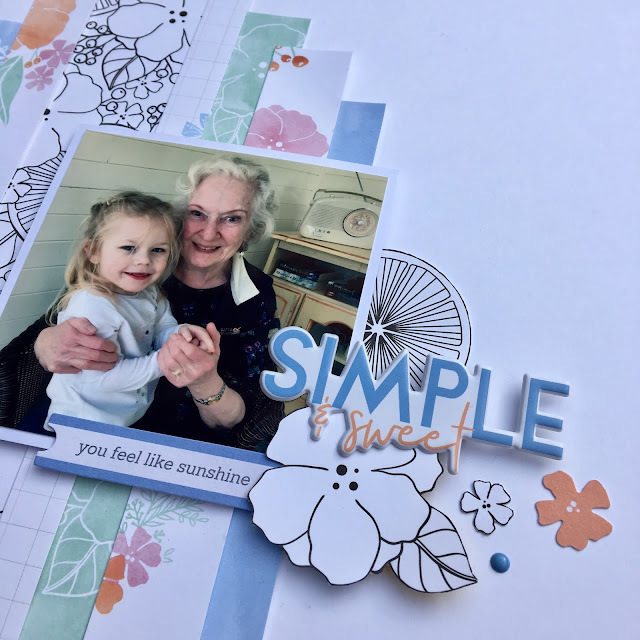 Simple Sketches worksheets are included in a printed format in all main Quirky Kit boxes. Here you can download all the back issues in PDF format. Click each link to download and save a copy to your device.